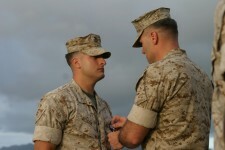 The President of the United States of America takes pleasure in presenting the Silver Star to First Lieutenant Stephen J. Boada, United States Marine Corps, for conspicuous gallantry and intrepidity in action against the enemy while serving as Forward Observer and Forward Air Controller, Company K, Third Battalion, Third Marines, U.S. Marine Corps Forces, Central Command in support of Combined Joint Task Force-76 and Operation ENDURING FREEDOM from 5 to 9 May 2005. While operating near Shatagal Village, First Lieutenant Boada’s platoon received intelligence that Al Qaeda and Associate Movement fighters were setting up an ambush position from which to attack the platoon upon their departure from Shatagal. Despite the barrage of intense enemy fire, he calmly directed the tactical employment of the unit and directed fires from an A-10 aircraft onto enemy positions. During the ensuing firefight, First Lieutenant Boada and members of his squad were wounded. Ignoring his injuries, he continued to fearlessly lead his Marines as they fought off a tenacious enemy while other members of the unit extracted their fallen comrades. As the platoon maneuvered over five kilometers of arduous mountain terrain with the injured Marines, First Lieutenant Boada called for and directed AC-130 aircraft to cover the unit’s movement. This action resulted in the destruction of the besieging enemy. 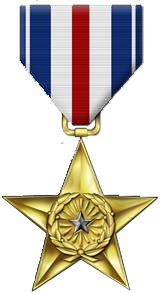 Without question, First Lieutenant Boada’s tactical acumen in directing these aircraft saved many lives in the platoon as the enemy’s ambush positions controlled the high ground through the terrain in which the platoon was conducting its retrograde. By his bold leadership, wise judgment, and complete dedication to duty, First Lieutenant Boada reflected great credit upon himself and upheld the highest traditions of the Marine Corps and the United States Naval Service.